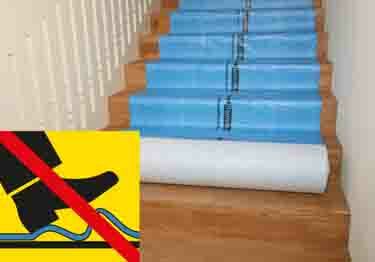 Protect floors and carpet from damage with waterproof, breathable, reusable, antiskid floor protection film! This strong, innovative surface protective product is great for all types of flooring. Ideal for protecting floors during remodeling, new construction, painting, moving, and more. Made of recycled polyester film. The surface side is waterproof and breathable. The underside has a spray on adhesive, making this unique protection film slightly adherent. Single Roll Coverage: 280 Sq. Ft.
Square Feet Per Roll: 280 ft. When laying rolls of film next to each other, overlap the film rolls by about 2 inches on each side. Tape down the overlapping part of the rolls. To avoid accidents, the joints of the mat should be taped down. Great for protecting floors during remodeling, new construction, moving, painting, and more! Note: Do not use on wet flooring, floors must be completely cured prior to use of this product. Protect floors and carpet from damage with waterproof, breathable, reusable, antiskid floor protection film! This strong, innovative surface protective product is great for all types of flooring. Ideal for protecting floors during remodeling, new construction, painting, moving, and more. Made of recycled polyester film.